Do you want to follow the GM diet for weight loss? Then you should first understand the relation between the Wonder soup and General Motors diet. Without eating this cabbage soup during the GM diet program, you won’t be able to see the results like you wanted. The vegetable soup is one among the main ingredients for quick weight loss in the 7 day diet plan. 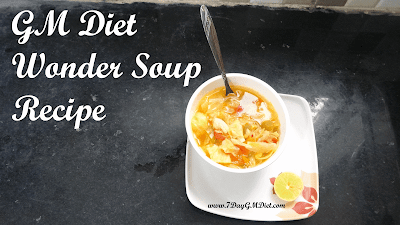 The wonder soup is a big part of the GM diet weight loss strategy. You can have the wonder soup as many times as you like it, either while you’re on the 1 week diet or include it in your regular lifestyle. I’ve personally replaced my last meal (dinner) with the soup as it is low in calories and also nutritious. However, not many people know the exact method of preparing the GM diet wonder soup and for those followers, here is the step by step recipe. How to Prepare GM Diet Wonder Soup? This vegetable soup recipe is pretty easy to make and the ingredients you’ll need are below. First, chop all the ingredients such as onions, cabbage, carrot, tomatoes, green pepper, celery into small pieces. Next, place the pressure cooker pan (without lid) on the stove and add 1 tsp of Olive oil. First, add the onions and fry them until golden brown, followed by the rest of the ingredients. Lastly, add 1/2 tsp of salt and enough water to fill up the veggies in the pan. Now, place the lid of the pressure cooker and allow it to cook until 3-4 whistles. Switch off the stove and leave the cooker untouched for another 5-7 minutes. Now, open the lid and pour the wonder soup into a bowl. P.S: You can have this soup on all days of the GM diet. Anytime you feel hunger, simply make this wonder soup and fill your stomach. You can have this soup even when you’re not on the diet. Recently, a few people have sent their queries to our inbox, asking whether the red cabbage promotes weight loss like the white one. In order to answer that question, first we should know the differences between white cabbage and red cabbage. The red cabbage has got more Vitamin C when compared with the white one or even Oranges in that case. 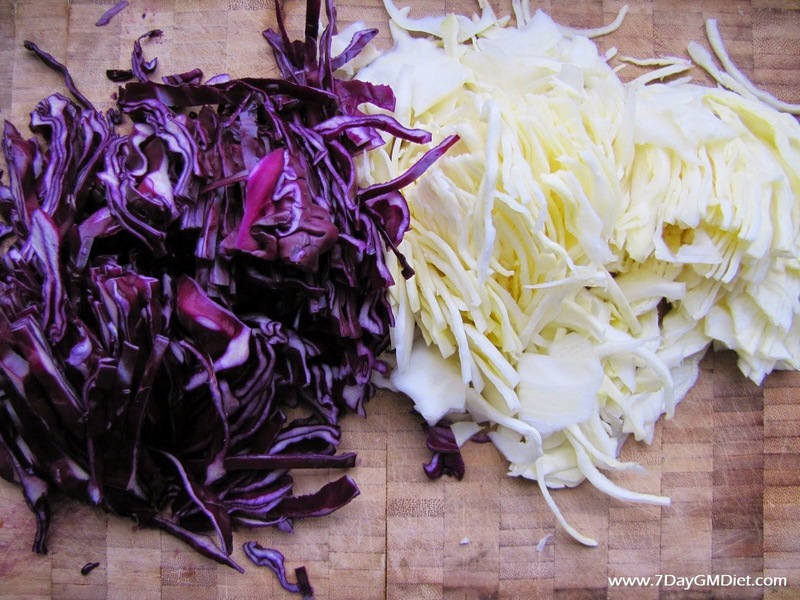 1 ounce or 28gms of raw red cabbage give you 27% of the DV (daily value) of ‘C’ vitamin while the white or green cabbage contains only 17% of DV per 1 ounce. Vitaminc C is known for its awesome ability to boost our immunity system, apart from keeping our skin, teeth and bones strong. The red cabbages contain ‘anthocyanins‘ which help protect your body from many degenerative diseases. Unfortunately, this is missing in the white cabbages. As per the study in Feb 2002, scientists found that anthocyanins in red cabbage had anti-cancer effects. You can get more ‘glucosinolates‘ in red cabbages than the white ones. These glucosinolates along with anthocyanins are proven to hinder cancer cell proliferation. The White/green cabbage contains more vitamin K than the red ones. While 1 ounce of red cabbage gives you 13% DV of ‘K’ vitamin, the white ones give you a whooping 27%. When we compare all the health benefits of white and red cabbages, the red ones are a clear winner. So, it is clear that red cabbages have more benefits over their white counterpart. Now, let us find out whether the red color cabbages are good for weight loss or not? Calories: They contain very less calories; a cup of raw shredded cabbage contains just 22 calories. It has more water, 5.2 gms of carbohydrates and 1 gm of protein. It is no doubt, fat FREE. Energy: Since the cabbage is a very low calorie food, you can become full by eating large amounts of it without worrying about adding more calories to your body. According to a study, eating red cabbage before the meal will make you eat smaller portion of high caloric foods like meat because you’ll already be full by then. According to a study published in the ‘European Journal of Clinical Nutrition’ in the year 2007, people who consumed at least 400gms of vegetables & 300gms of fruits per day lost more weight when compared with those who were put into restricted diet. So, eating more red cabbage may help you lose weight. Final Verdict: As we look at the above facts, it is crystal clear that red cabbages have got more healthy benefits over the white ones. However both the cabbage types can equally contribute to weight loss. So, by replacing the white cabbages in the wonder soup with the red ones, you can lose weight and the same time get the vitamins which are a bit lesser in quantity in the white cabbages. Previous Post:How Many Liters of Water to Drink Each Day to Improve Overall Health?